One of my friends posted this video on facebook. I am really going to have to try these. She makes it look pretty easy, and they look really good. When I posted the recipe for the flatbread I made Peggy last year, Zemanta suggested this - Olive oil adds snap to Sardinian flatbread. It looked really good, but I forgot all about it, until this week. So today I tried it. Heat the oven to 500°. Cut the dough into 12 small balls and flatten each into a 3- to 4-inch patty. On a well-floured surface, use a rolling pin to roll each patty into a 6- to 8-inch circle. The dough should be so thin you can almost see through it. 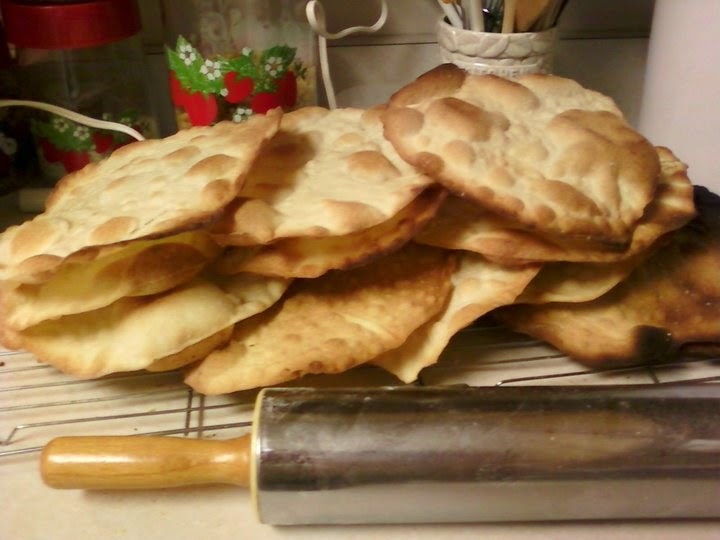 Put the dough on ungreased cookie sheets, sprinkle with sea salt if you like, and bake for about 2 to 3 minutes, keeping a very close eye on the breads — they can burn very quickly. Once they begin to puff up and brown, flip and cook for another minute or so. Repeat with all the dough and let cool completely. The last couple years I've been making my Oatmeal Bread recipe for Unleavened Bread - just not using yeast and rolling it into 4 approximately 8-inch rounds to bake. It's soft and chewy and yummy. But, I still like the thin, crunchy stuff, so I make this too. I took some last night for Night to Be Observed and again today for the 1st Day of Unleavened Bread, and it was really popular. I find that it's hard to stop eating it. Mix salt and flour; cut softened butter into small pieces and cut into flour as for pastry. Mix oil and water and add to butter/flour mixture. Mix and knead lightly. Pinch of 1/3 cup of dough. Pat as thin as possible; then roll a little thinner with rolling pin. Flip and repeat as needed until dough is so thin it just holds together without breaking when handled. Place on ungreased baking sheet and mark into squares. Bake at 400° 8-12 minutes of until puffed and lightly browned; break apart and cool on a wire rack. Repeat with the rest of the dough. I'm not sure I roll it quite that thin, but it is pretty thin. Also, I've found that baking this on a pizza pan works really well. That way you don't have to worry about whether or not it fits on your cookie sheet. This is so good and so easy. I don't really know what I should call it - it needs a creative name. Anyway, my mother-in-law was the one who got me started making this. Before that I always thought of Butternut squash as a sweet thing, for pies or to be baked with brown sugar and cinnamon. This is better! Or as good, in a different way. Brown ground beef with onion and pepper; drain fat. Grease a 13x9" pan and add the squash and potatoes. Note, there are no real measurements here; just throw in whatever looks good. Add browned beef, drizzle with some olive oil, and season with salt and pepper. Spread tomatoes on top and bake at 375° for an hour or more, stirring once or twice, until squash and potatoes are soft. Cook this for at least an hour. Longer, and the potatoes and squash get browned and roasted and yummy, which I really like. It all depends on what you like and how much time you have. I'm trying to install a new comment system, but it's only supposed to be on new posts. So, I need a new post to test it and see if it worked. I may or may not leave this post once I figure it out. Probably not. It has nothing to do with food. Our favorite pizza at Papa Murphy's is the Gourmet Chicken Garlic Pizza, so when I found this recipe at Babblelots, I had to grab it. I must try this! Or, how I took a quick recipe and made it take 500 times longer! Mix well, cover and allow to sit for a couple hours. Then, spread batter into greased 13x9" pan. It will be thick. Combine cinnamon mixture in a small bowl by mixing with fork; spread evenly over batter. Using fingers, poke topping thoroughly into batter. Cover and let sit for about an hour, then refrigerate overnight. When ready to bake, remove pan from refrigerator and let sit at room temperature for a half hour or so. Place in a COLD oven; set temperature to 350°F and bake 25-30 minutes, until lightly browned and firm in center. Cool 10 minutes. Combine icing ingredients and drizzle over warm cake. Nobody tell my husband that, as I was posting this recipe I realized that I had basically doubled the batter, but I forgot to double the cinnamon topping. It looked like I had plenty when I poked it in, but we'll see in the morning. So, for now, this is how I did it. If it doesn't seem like enough, I'll change it.